Third in line to jump on the freighter bandwagon, the Republic decided early in the design process to focus on a balance between all ship systems. True to form, their creation is comparatively lightweight - though lightweight is certainly not a term easily applicable to this giant. 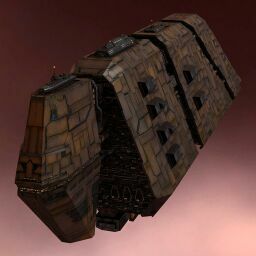 The Fenrir is notable among freighters because it is the fastest to align, which substantially reduces travel time for long trips. However, it has the smallest cargohold (tied with the Providence) as a tradeoff for speed. In practice this is not a problem since a maximum capacity of 845k m³ is often used as the unofficial limit for courier contracts . Fitting 2 Expanded Cargohold II modules in the low slots will allow a Fenrir to carry this much cargo with a free slot for the third low. Further information about additional or recommended skills to pilot Fenrir for a specific or it's common role(s) can be written here. No sub-article about Fenrir roles or piloting tactics. You can write them here. ^  - "...maximum size of Red Frog Freight orders to 845 000 m3." This page was last modified on 31 December 2016, at 12:52. This page has been accessed 72,660 times.